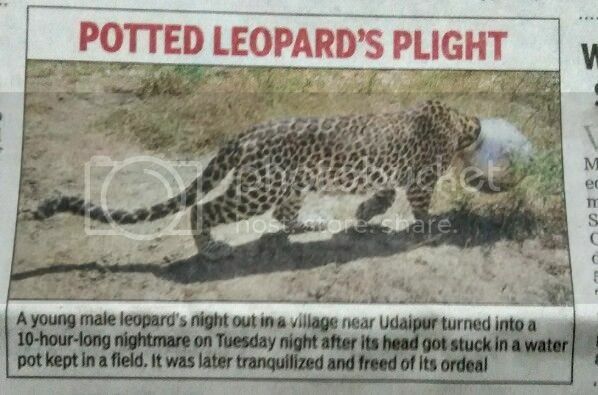 Re: Thirsty Leopard Gets Potted!!!!! This was one job well done by the forest dept. though some of you know my extremist views of shooting down 'man eating leopards'. Most of us believe that the leopard has to be protected for the future even at the cost of human life, because we are encroaching on their territory. But this poor fellow was just out for a drink and got stuck, hence freeing him of his trouble and letting him go free was a brave and appreciable thing to do. We have an elevated highway called "NICE road" in bangalore along kanakpura road stretch. Here couple years back one day a leopard was killed on the highway due to accident. Saw a video of this. Wasn't sure whether to laugh at it or feel sad. Did a little bit of both..
Can you post the link to the video. It should be interesting. Did forest department return the pot to whom it belonged? Walibaba nice joke about the pot..glad leopard survived for nOW.. When an animal as such gets potted the reason being lack of availability of water. The forest department should work on conservation n of existing waterbodies inside the forest and should additionally come up with artificial water bodies inside forest range. This would ensure mitigating the age old fight of terrain between human society and the creatures of forest, further ensure non occurrence of such incidents.